Study Searches for Microplastics in Sacramento Rivers – Neptune 911! A UC Davis researcher is studying whether tiny bits of plastic used in face washes, toothpaste and other consumer products are accumulating in Sacramento-area rivers and flowing out to the Pacific Ocean. Manufacturers of cosmetics such as L’Oréal, Neutrogena and Johnson & Johnson use microbeads for their exfoliant properties. A cosmetic product may contain microbeads if it lists polyethylene as an ingredient. 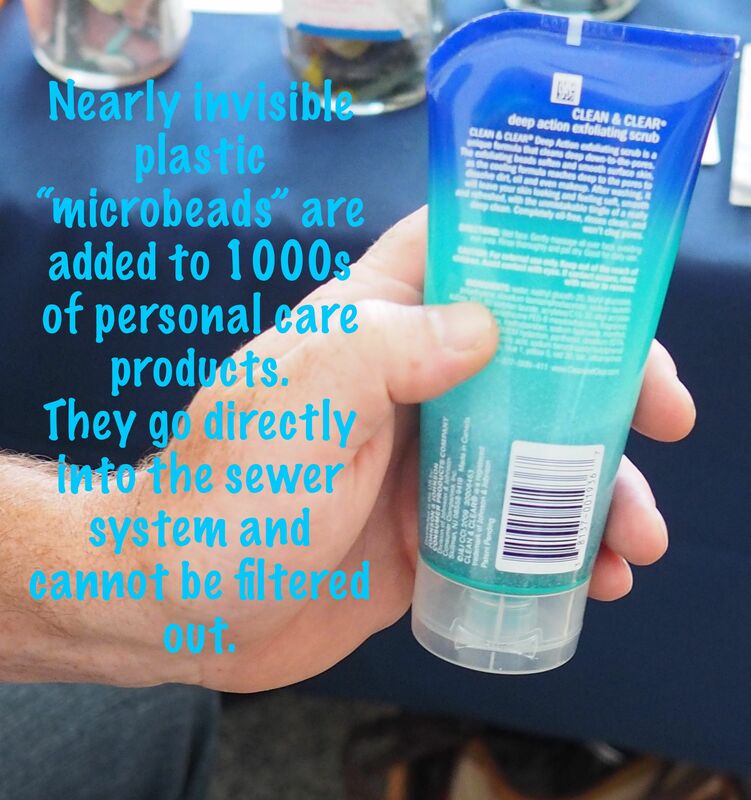 Microbeads are part of a large family of microplastic. Microplastics, which are smaller than 5 millimeters, are fragments of degraded plastic from myriad sources. Many studies have found that microbeads and microplastics accumulate in fish that live in rivers, lakes and oceans. The plastics pose a health concern for animals and people because they absorb pollutants like DDT, flame retardants and pesticides, Rochman said. She is one of about 50 scientists pushing for microbeads to be phased out in California. A bill moving through the Legislature, AB 888, would ban the sale of products made with microbeads by 2020. A similar bill failed to win passage last year. Last year, Illinois became the first state to ban cosmetics using microbeads. Last month, Colorado and New Jersey followed suit. The California Water Resources Control Board is looking into microbeads as well. “This is an issue of emerging concern,” said board spokesman Tim Moran. Some cosmetics-makers have announced plans to stop using microbeads. L’Oréal, for instance, says it will remove them from its scrubs by 2017. The same focus has been underway at Johnson & Johnson, which uses microbeads in its Clean & Clear facial scrubs. “We stopped the use of polyethylene beads in new products globally last year when we announced our 2017 goal,” said company spokeswoman Peggy Ballman. Ballman said Johnson & Johnson is reformulating its products with alternative materials. She did not say what materials will be used. Rochman has been sampling the effluent from the Sacramento regional wastewater treatment plant on the Sacramento River and the water near wastewater plants in Antioch and Napa to establish if microbeads are entering river environments. That study is not finished, but Rochman contends microplastics will certainly be found. Rochman is also sampling other watersheds, including Chesapeake Bay and Lake Ontario. Locally, she is also sampling clams in San Pablo Bay for evidence of microbeads or microplastic. Rochman conducted a study recently in which she fed fish microbeads and microplastic in a lab to assess any health effects. “We saw a significant increase in flame retardant in the fish,” Rochman said. Flame retardants have been associated with cancer, reduced sperm count and decreased IQ in children. There was also evidence of endocrine disruption in the fish fed the plastic, she said. Studies have found that microbeads in fish is a concern because some of the fish that eat the microplastic are also fish species that humans eat. When Rochman sampled fish she purchased in Half Moon Bay last October she found evidence of microplastic in the gut of the fish dissected. To date, more than 267 species in the marine environment are known to have been affected by entanglement in nets or plastic bags or by ingesting plastic, according to a 2012 study that was published in Environmental Contamination and Toxicology. The ocean has become a great dumping ground for plastic material. The United Nations Environment Program estimates that there are 18,000 pieces of plastic for every square kilometer of ocean. This plastic comes from a wide variety of sources, including microbeads. One culprit, Rochman said, are the plastic fibers in clothing. When synthetic cloth degrades, it sheds fibers into the washing machine, which then flow to the sewer system. “No one has looked into the toxicity of plastic fibers yet,” she said. Another new area of research will be establishing whether plastic sheeting used to cover crops has been contributing to microplastic in rivers and the ocean. Such plastic sheeting is common in California strawberry fields. “This plastic gets shredded in the normal process of tilling the soil,” said Stiv Wilson, campaign director for the Story of Stuff Project. “The Chesapeake Bay system is crazy polluted with this kind of microplastic,” Wilson said.